This impressive two storey stone gatehouse is all that remains of Alnwick Abbey, a 12th-century abbey of Premonstratensian monks, founded by Eustace Fitz-John. The gatehouse itself was built in the 14th century by the De Vescy family, whose coat of arms can be seen over the barrel-vaulted arch through the gatehouse. 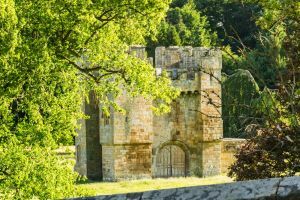 It can only be accessed on foot, following signposted paths through Hulne Park, hunting grounds owned by the Dukes of Northumberland (see Alnwick Castle entry). The abbey was established in 1147 as a daughter house of Newhouse Abbey in Lincolnshire and supported between 17 and 30 canons before it was eventually dissolved by Henry VIII in 1535. Curiously, the abbey was no sooner dissolved than it was refounded in 1536, only to be dissolved permanently in 1539. The abbey received a sizeable endowment, which must have helped when it came to entertaining guests. A record exists detailing a feast given in 1376 by Abbot Walter de Hepescotes, who entertained 120 leading knights in the refectory, while over 1,000 commoners feasted in the cloisters. Several members of the powerful Percy family of Alnwick were buried in the Abbey, including the 2nd and 3rd Lords of Alnwick. Henry, the 4th Lord and three of his sons were admitted to the brotherhood of the abbey chapter in 1372-3. As the leader of an important monastery, the Abbot of Alnwick was frequently summoned to attend Parliament under Edward II. When the abbey was finally dissolved there were 13 canons in residence. The abbey's estates were granted to Ralph Sadler and Laurence Winnington, and later passed to the Doubleday family. The abbey was excavated in 1889 and the rough layout of the abbey buildings can be seen on the ground. The gatehouse is Grade I listed as a Scheduled Ancient Monument. Also in Hulne Park are the extensive remains of Hulne Priory, a 13th-century friary of Carmelite monks. On our last visit access to the Abbey Gatehouse off the B6346 (Canongate) was clearly marked as 'Private', with no admittance to the general public. Trails through Hulne Park that had formerly allowed access were also designated as private. It seems that for the moment at least there is no public access. You can get a reasonable - albeit distant - view of the gatehouse on the B6346 as it rises up the hill just north of the Canongate bridge. That is the view shown in our photo of the gatehouse. Location: Park along the verge of Ratten Row, off the B6346 Wooler road. Access by footpath across Hulne Park. No visitor facilities. 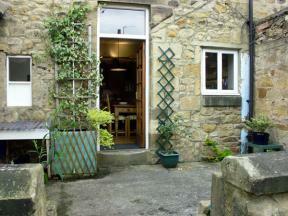 A Grade II listed, stone-built, end-terrace townhouse, in the centre of Alnwick and can sleep six people in three bedrooms.